NEED A DRAIN CLEARANCE SPECIALIST IN HAMPSHIRE? THEN LOOK NO FURTHER. Aldershot-based N.L AllDrains provides professional, competitive drain unblocking and maintenance services serving the: Aldershot, Alton, Bordon, Camberley, Farnham, Farnborough, Fleet and Guildford areas. We are friendly, local and 100% independent. Our prompt and effective drain unblocking services have resulted in a growing reputation among new and existing customers. Our blocked drain services include CCTV surveys, high-pressure jetting and emergency drain cleaning. We also specialise in water main installation and repairs, drain repairs, groundwork, and treatment plant and septic tank installation. We undertake surveys and provide written reports for insurance claims. Our prices are extremely competitive and our staff are well trained, professional, punctual and will complete the job for the agreed cost. For a 100% FREE, no obligation estimate and GUARANTEED 2-hour response time, call us today on 01252 854004 or use our contact page. Is your shower tray, bath or sink taking too long to empty? Does your kitchen drain overflow? Are you having trouble flushing your toilet? All these symptoms may well be caused by a blocked drain. You can see the common causes of blocked drains here (link to the stop blocked drains advice) We clear blocked drains, foul or storm water systems by rodding or high pressure water jetting to release blockages and restore flow to drains. Call us today for a low-cost (only £50.00) fast and guaranteed drain clearance service. And we don’t charge for the VAT. If we don’t manage to clear the drain, we won’t charge you a penny. Our ‘No Dig’ Structural Lining technology is ideal for repairing damaged drains caused by water infiltration, root intrusion, ground pressure cracks and fractures; saving you time and money. We can carry out structural lining underneath buildings, patios, drives and lawns without the need for any excavation for drains or sewer pipes from 100mm – 150mm. Root ingress is removed from pipework prior to structural lining by means of high pressure water jetting. Contact N.L. AllDrains today for free estimate and once we arrive on site, you can have a new drain within a matter of hours. Need a new water main installing but don’t want to, or can’t excavate? At a third of the cost of continuous trench excavations, Impact Moling is the ideal solution for installing new water pipes. We excavated pits every 12 metres and use a compressed air driven impact mole to bore through the ground then pull the new water main through. Most properties will only require two pits. Impact Moling is perfect for use under driveways, car parks, paths, golf courses and gardens and other areas where you require minimal disturbance to the surface above. To learn more about this technology and how you could benefit from it, get in touch with N.L. AllDrains today. CCTV investigation of drains is the fastest, most comprehensive and cost-effective way to survey your drainage system. We use small closed-circuit television cameras to examine drains to find the causes of blockages or structural failure. The CCTV equipment is highly portable and can survey pipe diameters up to 300mm. We can capture selected images from the video output to included in the detailed report that you will receive as part of the survey. A CCTV inspection will reveal most structural defects within a drain, including tree root penetration, cracked or fractured pipes, displaced joints and poor gradients. For more information contact N.L. AllDrains today. When it comes to sewage, you cannot cut corners. In Hampshire ground water provides up to 80% of drinking water and there are strict Environment Agency guidelines on the installation of septic tanks and sewage treatment plants. In some areas only sewage treatment plants are permitted due to septic tanks having the potential contaminate drinking water. N.L. AllDrains carries out ground water zone or special interest area checks and installs the proposed septic tank or sewage treatment plant following Environment Agency guidelines. Contact us today for more information and a FREE survey and estimate. Get in touch today by phone, by email or using our contact form. Another cause of blocked drains in Hampshire is hair. Remove hair from your bathroom sink, shower and bath plugs. Empty the traps if you can access them. Solidified cooking oils and food remains regularly result in a blocked kitchen drain in Hampshire. Pour waste fat into a glass container and bin it. Remove leaves, debris and rubbish from your external gullies, drain grids and guttering. Another major cause of blocked drains in Hampshire. Lift your outside inspection covers periodically to check that the drains are free flowing and that there is no lime scale, fat or grease build up. Problem with blocked drains in Hampshire? N.L. AllDrains can help! N.L All Drains have a professional team, available 24 hours a day, 7 days a week covering a ten mile radius of many local towns in and around Hampshire and Surrey, specifically covering Alton, Aldershot, Bordon, Camberley, Farnborough, Farnham, Fleet and Guildford. If you’re unsure if we service your area for fast blocked drain clearance in Hampshire and Surrey, then get in touch. 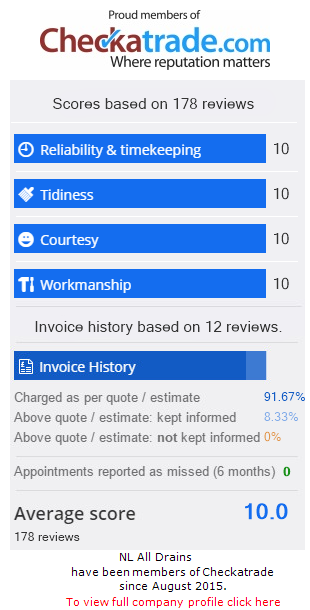 We've been rated 9.97 out of 10 by 65 customers. © Copyright N.L AllDrains, All rights reserved.